She was tired and she knew she couldn't escape the village with her being sleepy. She needed the energy to start a new day. She crept into the Inn, silently with her hood on. If the inn-keeper knew who she was she'd be given up. As she marched inside, she caught sight of some of the castle's guards. She pulled on the hood, as she walked towards the counter. "One room please." She said, in a voice deeper than hers. She needed to deepen her tone if she was going to pass as someone other than herself. The inn-keeper eyed her suspiciously and she could feel the sweat trickling down by her face. The inn-keeper handed her a key and Taoxin nodded. Just as she began to walk towards the room, she felt people run after her. She swiftly turned around, letting the hood drop to her shoulders. The guards grinned as they cornered her. "We've got you now Princess. Your father is very disappointed in you. And your 'friend' won't get away with his crime." The captain said. She glared at him. "You guards are so unfair! You think you can get away with everything you do. Well you can't. What have you done with him? Imprisonment for a month?!" She said, hissing at them. "I wouldn't say prison." One of them said, chuckling and the Princess knew her face turn pale. Torture? Her father's men knew how to torture betrayers. And it was hard. Her father was cruel with these kinds of things, and she gasped at the thought of it. She needed someone to help her, now. One symbol could take care of all these men, but one symbol couldn't escape that easily. She sighed, transforming into a tiger and charging through the men. People gasped at the sight of her, and she changed back outside of the inn. Jumping, she grasped onto one of the windows. She pulled herself up, and jumped into a different surface. She managed to climb the window before getting onto the roof. Her eyes scanned the ground below as she saw the guards rush out. "What have I gotten myself into?" She whispered. Hmm, By the looks of it you got youself in trouble. Now white tiger do you need me assistance? I am Ige, The fire symbol. I hate my animal i don't want to be a gaint bird but i suppose i must deal with it. But besides my hatred of the animal i will assist you." Ige said as he was behind her, he kept a close eye on everyone who was a symbol, though he wasn't one for stalking he had to. His fellow symbols keep dieing when they act like heros, only he has been the one who has managed to stay alive the longest and not be reincarnated the most. Though that made him a coward in other people's eyes, Ige shook himself as he regained focus, he needed to see if he could help his fellow symbol. "Hmm, By the looks of it you got youself in trouble. Now white tiger do you need me assistance? 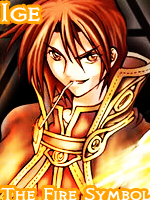 I am Ige, The fire symbol. I hate my animal i don't want to be a gaint bird but i suppose i must deal with it. But besides my hatred of the animal i will assist you." "Vermilion bird...?" Taoxin whispered at the man whom was behind her. She turned to face him and she grinned. Yes, she needed his assistance and since he was a giant bird they could get to the palace easily. "Ige, I do need your assistance. If you please... I got a man into trouble and now my father's probably handling him in the Torture chamber." She said with a sigh. Her plan was to escape, not to return to the place she didn't want to go. "Hmm The palace? I suppose you want me to save your boyfriend?" He said while adding emphasise to the word 'Boyfriend'. He quickly scanned the area and took in a deep breath, "i guess i will help you, i just don't think its wise to have a love interest. Well point me in the right direction and i will transform. Though it might not be an easy ride since they will attempt to stop me, i suggest that you cover me while i fly, my fire can help me out to a minimum when i am in my animal state." He stood up and began to have a pillar of fire erupt from his body, it stretched high into the air as it started to widen up. It didn't move towards his fellow symbol instead it moved back as to give her room, The fire started to clear as ige stood there in his bird form, he was crouched down awaiting for her to hop ontop of him to take flight. "Love interest?" Taoxin said adding a small laugh. That man was older than her. Too old to be a love interest. "Ige, you have it wrong here. He's at least twenty-five! And I'm..er fifteen." Plus Taoxin wasn't one to want a love interest anyways. She thought that they'd hold her down unless he could keep up with her. She shook her head. Sun Qwanh wasn't even her type. She saw Ige transform into a giant bird. Boy, he wasn't kidding about anything. She grinned as she hopped on then slightly frowned. Was she the only symbol who couldn't fly? "To the palace!" She said. Ige jumped forward as he began to flap his wings towards the empire, they glided across the sky as many people looked up and cheered at his form. Seeing a symbol brought happiness to many, he glided and flapped his wings again gaining altitude seeing the empire he smiled. They came within 1000 yards of the place as a volley of airs unleashed upon them, Ige quickly moved and used his fire to burn the reast he didn't dodge. The empire didn't want him or anyone else entering it seemed, Inside the castle people were yelling at ige as he began to close in. Many were screaming of back up coming for the prisoner ige had not known yet, As they were 400 yards apart he noticed the arrows stopped. He was too close he figured since that if he had any achers they would be able to shoot down theirs, 300 yards apart ige was almost their. Taoxin watched as they approached the palace. Seems many people liked looking at giant birds in the sky. As they neared the walls, they saw what seemed to be an army of guards leading a prisoner in. She frowned lightly seeing them. Arrows came rushing at them at tremendous speed but Ige didn't seem to dodge. They were at least 300 feet in the air, and finally they landed.